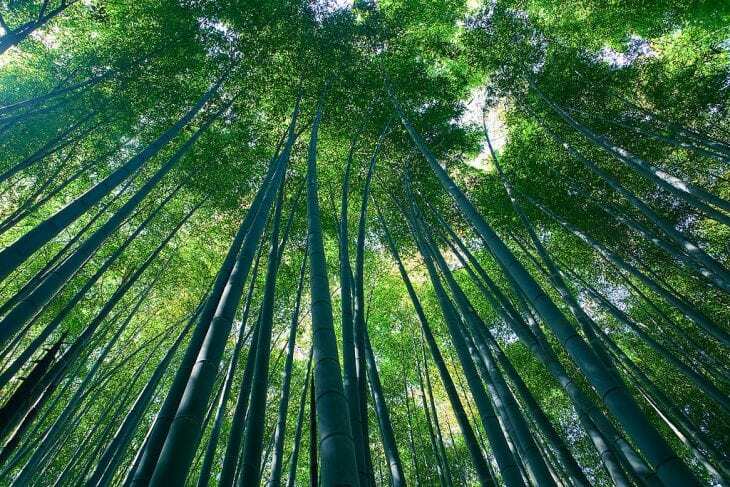 A magnificent Bamboo forest in the district of Arashiyama, west to Kyoto, Japan. Located in the southern Sierra Nevada mountains of California. The forest is named for the majestic Giant Sequoia trees which populate 38 distinct groves within the boundaries of the forest. The Sequoia National Forest covers 4,829 sq km (1,865 sq mi). – Also in California, The Redwood National parks is a combination of four parks that together protect 45% of all remaining coast redwood (Sequoia sempervirens) old-growth forests, totaling at least 158 square km. These trees are the tallest and one of the most massive tree species on Earth. Schwarzwald or “Black Forest” is a wooded mountain range in Baden-Württemberg, southwestern Germany. It is bordered by the Rhine valley to the west and south. The name “Black Forest” was given by the Romans who referred to the forest blocking out most of the sunlight from getting inside the forest by the dense growth of conifers. A grove of oddly-shaped pine trees. This young forest was planted around 1930 and has about 400 pines. It is generally believed that some form of human tool or technique was used to make the trees grow this way, but the method and motive are not currently known. Some believe that the woods were deliberately grown this way to make “Compass Timbers”, or trees that are deliberately shaped for the purpose of using those odd shapes in shipbuilding. Another theory is that tanks from WWII are the cause, rolling over the young trees snapping the stem, but still surviving, forcing them to grow in the direction they were ran over. The “Valley of Nine Villages” is known for its many multi-level waterfalls, colorful lakes, and snow-capped peaks. Its elevation ranges from 2,000 to 4,500 metres (6,600 to 14,800 ft). It’s a UNESCO World Heritage Site since 1992 and a World Biosphere Reserve since 1997. A forest reserve named after the nearby town of Monteverde. The reserve consists of over 10,500 hectares (26,000 acres) of tropical rainforest and visited by roughly 70,000 visitors a year. The Reserve consists of 6 ecological zones, 90% of which are the virgin forest. The reserve has extremely high biodiversity, consisting of over 2,500 plant species (including the most orchid species in a single place), 100 species of mammals, 400 bird species, 120 reptilian and amphibian species, and thousands of insects. A tropical rainforest on the northeast coast of Queensland, Australia. It is probably the oldest tropical rainforest on the planet, having existed continuously for the past 110 million years. This rainforest has a wide range of animals including kangaroos, wallabies and platypuses. A moist broadleaf rainforest that covers 5,500,000 square km (2,100,000 sq mi). This region is located within 9 nations: 60% of the area is in Brazil, and the rest is in Peru, Colombia, Venezuela, Ecuador, Bolivia, Guyana, Suriname and French Guiana. The Amazon represents over half of the planet’s remaining rainforests, and it comprises the largest and most species-rich tract of tropical rainforest in the world. Inside the Olympic National Park, located the Olympic National Forest. It’s a temperate rainforest and one of the largest, if not the largest, temperate rainforests in the world. It is also the wettest place in the continental United States. i never seen this type of forest.i am very much fond of forests.thanks for information. time will come our next to next generation may see the forests in picture only. there are so many secrets hidden in forests…Forests consume you…!